The towns, backroads, and museums of the Eastern Shore and Delaware are chock full of fun Christmas events. Nearly 70 of those affairs are rounded up here in one convenient place, organized by date. • Fri, Nov. 30: The Easton (Md.) Moonlight Madness shopping event will have caroling, live music, raffle prizes, and more. • Fri., Nov. 30: Pocomoke City, Md. has the Mayor’s Old Fashioned Christmas Evening with s’mores, music, refreshments, and Santa in the streets of downtown. • Fri., Nov. 30: There is a Tree Lighting Party in Elkton, Md. Pictures with Santa, too. • Fri., Nov. 30: The Pictures with Santa event in Easton, Md. takes place in the historic Bullitt House. No charge for the photos. • Nov. 30-Dec. 2: The Christmas on the Creek festivities in Oxford, Md. have gospel music, a shopping bazaar, tree lightings, and more. • Nov. 30-Dec. 2: The Easton, Md. Armory will hold a Christmas Marketplace with more than 40 crafts vendors. • Nov. 30, Dec. 7, 14, and 21: The weekly Festive Fridays celebrations unfold in downtown Cape Charles, Va.
• Nov. 30-Dec. 22: The Santa House will be up & running Fridays through Sundays in downtown Milford, Del. • Nov. 30-Dec. 29: At the Three Palms Zoo in Clayton, Del., the Zoo Lights & Christmas Nights events are held on Fridays and Saturdays with special light displays and decorated trees. • Nov. 30-Jan. 13: The Seaford (Del.) Historical Society has its Miniature Train Display up and running on weekends. • Sat., Dec. 1: The hugely popular Midnight Madness shopping extravaganza is held in St. Michaels, Md. • Sat., Dec. 1: It’s the 54th annual Christmas in Odessa, Del. tour of historic houses. 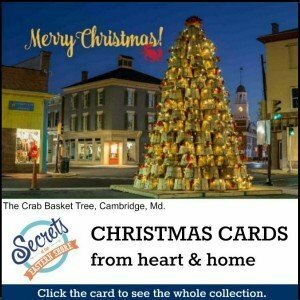 • Sat., Dec. 1: There is a Christmas Festival in the works in Melfa, Va.
• Sat., Dec. 1: In Rock Hall, Md., it’s time to light up The Crab Basket Christmas Tree. • Sat., Dec. 1: In Preston, Md., The historical society has its annual Christmas Open House. This is also the day the Community Club of Preston puts on its Holiday House Tour. • Sat., Dec. 1: The Delaware Agricultural Museum celebrates A Farmer’s Christmas with cider, farm treats, music, crafts, and more. • Sat., Dec. 1: The Furnacetown Living Heritage Village near Snow Hill, Md. celebrates Christmas in the Forest with crafts, live music, raffles, and more. • Sat., Dec. 1: Nine homes are featured in the Christmas House Tour in Lewes, Del. • Sat., Dec. 1: Santa will be holding court in the big hangar at the Air Mobility Museum Command Museum in Dover, Del. • Sat., Dec. 1: The Homes for the Holidays tour in Chincoteague, Va. benefits a group that provides hot meals to homebound residents in need. • Sat., Dec. 1: Santa will be holding court at the historic train station in Onley, Va.
• Dec. 1-2: The Dickens Christmas Weekend in Snow Hill, Md. features Victorian characters, roasted chestnuts, carriage rides, and more. • Dec. 1-2: The Delmarva Railroad Club has an open house and display in Delmar, Del. • Sat., Dec. 1 and Sat., Dec. 15: Have “Cookies with Santa” at the Salisbury Zoo on the first or the second of these dates. 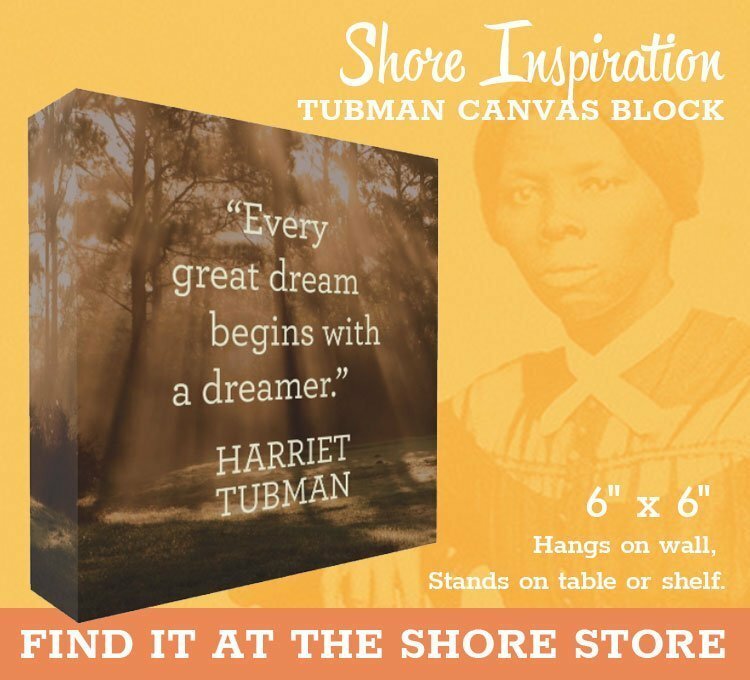 Set them on a shelf, table, or mantle–a new way to show off our local scenes and sights. Click on the image for info. • Dec. 1, 8, 15, and 22: On Saturdays in December, the Weekend Wonderland festivities in Bethany Beach, Del. feature caroling, shopping, and other holiday activities. 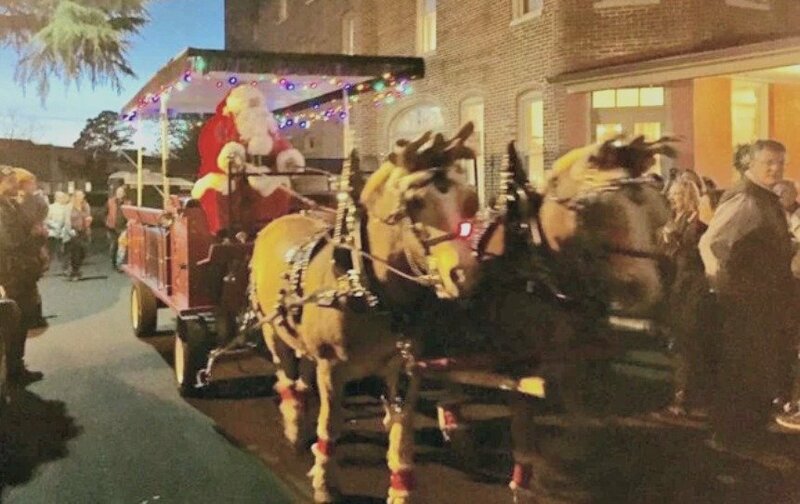 • Dec. 1, 8, 15, and 22: Carriage Rides through downtown Easton, Md. are available outside of the Tidewater Inn on all of the Saturdays before Christmas. • Dec. 1-22: An Ice Skating Rink will be up and running on Saturdays and Sundays in downtown Salisbury, Md. • Dec. 1-31: For more than 80 years now, the Rescue Fire Company in Cambridge has been displaying its popular Garden of Trains in the old firehouse downtown. • Sun., Dec. 2: Enjoy Breakfast with Santa at the Tidewater Inn in Easton, Md. • Dec. 2, 9, 15, and 16: Santa’s House on the Boardwalk will be up and running in Rehoboth Beach, Del. • Tue., Dec. 4: Enjoy Pizza with Santa at Northside Park in Ocean City, Md. • Wed., Dec. 5: Tree Lighting festivities are planned in Centreville, Md. Kids are welcome to bring ornaments to hang. Santa will be around as well. • Thu., Dec. 6: The Nature Conservancy is having an Holiday Open House at its Brownsville facility, which includes a historic home and scenic grounds in Nassawaddox, Va. There will be wagon rides. • Thu., Dec. 6: Ebeneezer’s Soiree is going to be a party straight out of a Dickens novel. The site is an old bank building in Chestertown, Md. • Thu., Dec. 6: Listen to and share your own “stories of peace” at The Be In: Voices and Performances of Peace, a gathering on the campus of Washington College in Chestertown, Md. featuring oral histories on the theme gathered by students and faculty in their recent work. • Fri., Dec. 7: Tour the shops of Elkton, Md. and taste entries at each stop in the town’s big annual Cookie Throwdown. 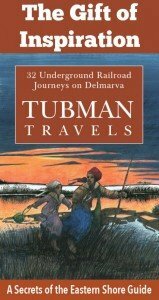 • Fri., Dec. 7: The interesting little Julia Purnell Museum in Snow Hill, Md. has its Holiday Open House with decorations, treats, and more. • Fri., Dec. 7: The Downtown Milford (Del.) Holiday Stroll has caroling, miniature horses, the Santa House, carriage rides, late shopping hours, and more. • Dec. 7-9: The Dickens of a Christmas Weekend in downtown Chestertown, Md. is chock full of activities, with live music, Victorian foods, children’s crafts, and much more. • Dec. 7-9: The annual Christmas in St. Michaels weekend is chock full of activities, too, with a house tour, gingerbread contest, holiday meals, a parade, and more. • Dec. 7-9: The historic Ross Mansion in Seaford, Del. 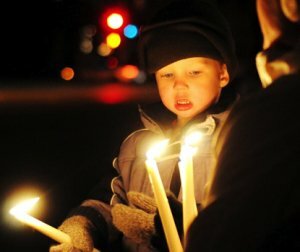 has its annual Victorian Weekend with caroling, candlelight tours, children’s activities, and more. 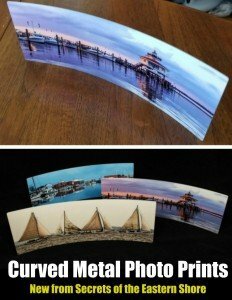 • Dec. 7-9, 14-15: The Tilghman Watermen’s Museum on Tilghman Island, Md. has its Christmas Wonderland display. • Sat., Dec. 8: The Downtown Painter (Va.) Holiday Market runs along the railroad tracks and features an array of local art, antiques, collectibles, and various other items. Food and hot beverages available. • Sat., Dec. 8: Get your photo taken with Santa on Victory Lane at the Dover Speedway in Dover, Del. • Sat., Dec. 8: Take a dip with the man in red at the annual Santa Swim for charity at the Hyatt resort in Cambridge, Md. • Sat., Dec. 8: Go bar-hopping with a pack of Santas at the annual Santa Con in Ocean City, Md. • Sat., Dec. 8: The crab pot Christmas tree will get lit during the Christmas in Crisfield festivities. • Sat., Dec. 8: There is another Santa Con bar-hopping extravaganza up on Kent Island, Md. • Sat., Dec. 8: There will be some Old Fashioned Christmas festivities in downtown Cambridge, Md. 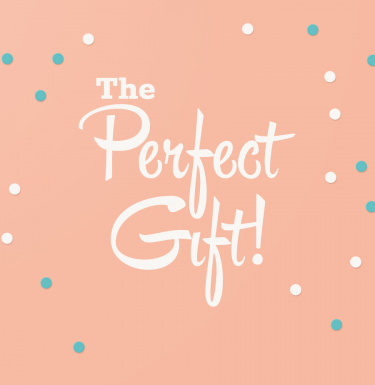 Carriage rides, carolers, Santa, late shopping, gallery receptions, and more. 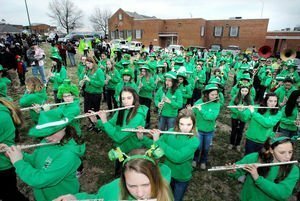 • Sat., Dec. 8: Musical events, house tours, and more are part of the town-wide Spirit of Christmas event in New Castle, Del. • Sat., Dec. 8: Wreaths, bows, swag, and more will be available at the Milton (Del.) Holly Festival in the town’s fire hall. The Milton Holiday House Tour is the same day. • Sat., Dec. 8: A Critter Christmas at the Salisbury (Md.) Zoo features multiple stations where kids can make gifts, crafts, and other fun items. • Dec. 8, 15, 22: On these three Saturdays, you can have Lunch with Santa while perusing a holiday marketplace in Loockerman Way Plaza in downtown Dover, Del. • Sun., Dec. 9: In Mardela Springs, Md., enjoy an Old Fashioned Barren Creek Springs Christmas with tours of historic properties, a 5K, a little parade, mini-concerts, caroling, and more. • Sun., Dec. 9: Downings United Methodist Church in Oak Hall, Va. will have Christmas music by the “Coastal Choirs” of several area churches. • Sun., Dec. 9: Enjoy Cookie & Wine pairings at Harvest Ridge Winery in Marydel, Del. • Sun., Dec. 9: Enjoy Cookie & Cocktail pairings at Painted Stave Distilling in Smyrna, Del. • Sun., Dec. 9: Accomac, Va. will have an Old Fashioned Christmas celebration. Tree lighting, music, and more. 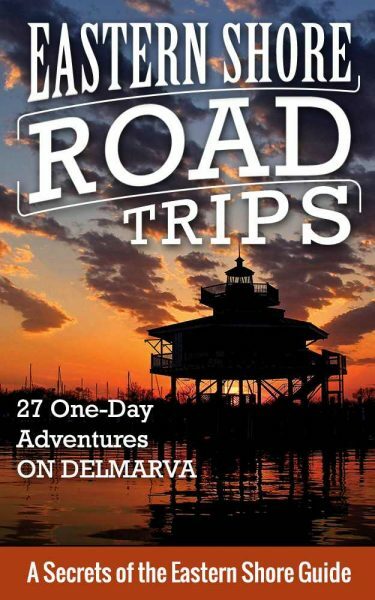 • Wed., Dec. 12: The Chesapeake Bay Maritime Museum in St. Michaels, Md. is having a free Holiday Open House with caroling, light refreshments, holiday decor, and gift-shop discounts. 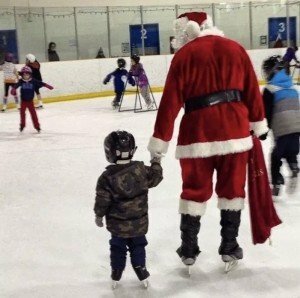 • Dec. 12-13: Go Skating with Santa on these weeknights at the indoor rink in the Talbot Community Center just north of Easton, Md. • Fri., Dec. 14: Bundle up and hop on your bike for the Salisbury Holiday Lights Bike Party, which will involve a pedaling tour the best decorated homes in town. • Fri., Dec. 14: Carolers and carriage rides highlight the Old Fashioned Christmas festivities in downtown Elkton, Md. • Sat., Dec. 15: The Winter Wonderland Music & Tree Festival at Governor’s Hall in Cambridge, Md. will feature local musicians, Santa visits, decorated trees, and more. • Sat., Dec. 15: The Pocomoke Train Garden Club will be showing off a holiday train display at the Delmarva Discovery Museum in Pocomoke City, Md. Scroll to this date at the link for info. 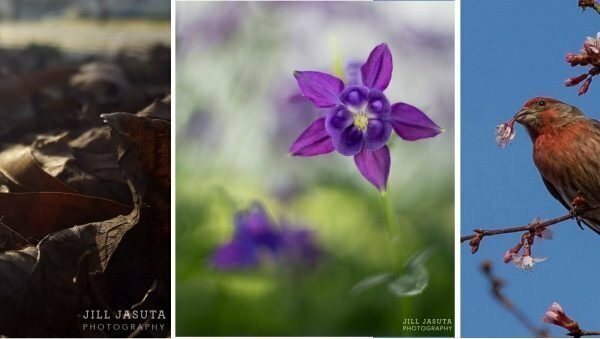 • Sat., Dec. 15: The Winter Wonderland event at the Ward Museum of Wildfowl Art in Salisbury, Md. will have craft activities, artist demos, Santa visits, and free museum admission. • Sat., Dec. 15: Santa Claus will be visiting the Secretary (Md.) Volunteer Fire Department. Kids will be able to take rides through town on a fire truck. • Sat., Dec. 15: The Luminaria Night Celebration in Vienna, Md. features more than 1,500 luminaria, church music, an old button factory open for tours, and house tours. • Sat., Dec. 15: The Hurlock (Md.) Volunteer Fire Department is putting on a Firemen’s Festival of Trees and Santa’s Workshop with kids’ crafts. • Sun., Dec. 16: The Historic Cape Charles Cookie Trail involves visits to B&Bs and private homes decorated for the holidays and serving up the title treat. • Sun., Dec. 16: Elsa, the Grinch, and other characters will be performing at the interactive Holiday Tea at the Milton (Del.) Theatre. Pictures with the characters are available after the show. • Fri., Dec. 21: The Snow Queen and King will be holding court at the Lemon Tree Gallery in Cape Charles, Va. Hot chocolate, cookies, a sing-a-long, and more.